Please note that the content of this book primarily consists of articles available from Wikipedia or other free sources online. 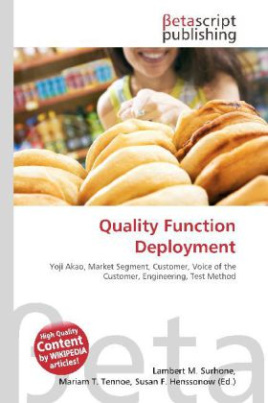 Quality function deployment (QFD) is a method to transform user demands into design quality, to deploy the functions forming quality, and to deploy methods for achieving the design quality into subsystems and component parts, and ultimately to specific elements of the manufacturing process. , as described by Dr. Yoji Akao, who originally developed QFD in Japan in 1966, when the author combined his work in quality assurance and quality control points with function deployment used in Value Engineering. QFD is designed to help planners focus on characteristics of a new or existing product or service from the viewpoints of market segments, company, or technology-development needs. The technique yields graphs and matrices. QFD helps transform customer needs (the voice of the customer [VOC]) into engineering characteristics (and appropriate test methods) for a product or service, prioritizing each product or service characteristic while simultaneously setting development targets for product or service.